The 2014 Epcot Food and Wine Festival is underway, and this year marks the debut of several new options for Festival guests. We’re going to cover two of the most popular — and most expensive — today! 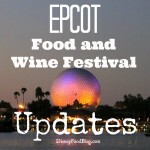 The Epcot Food & Wine Festival Premium Package is available exclusively to Disney Resort guests (as well as guests at Swan & Dolphin and Golden Oak), and the Food and Wine Festival — Late Nights LIVE! 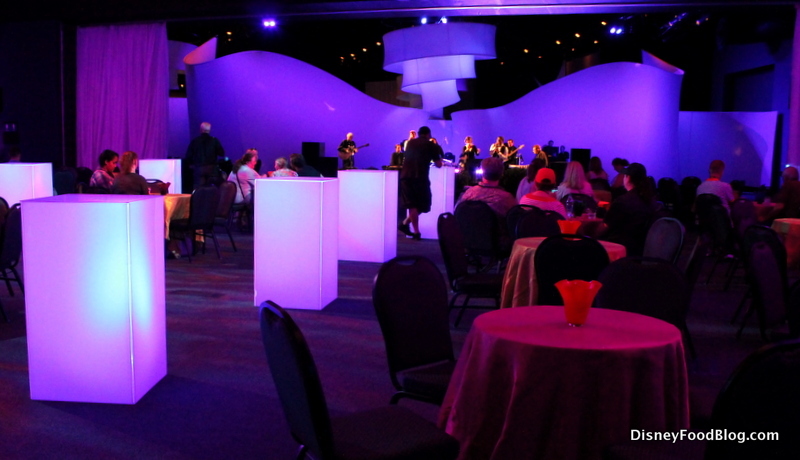 after hours party, which is available for purchase to all guests. 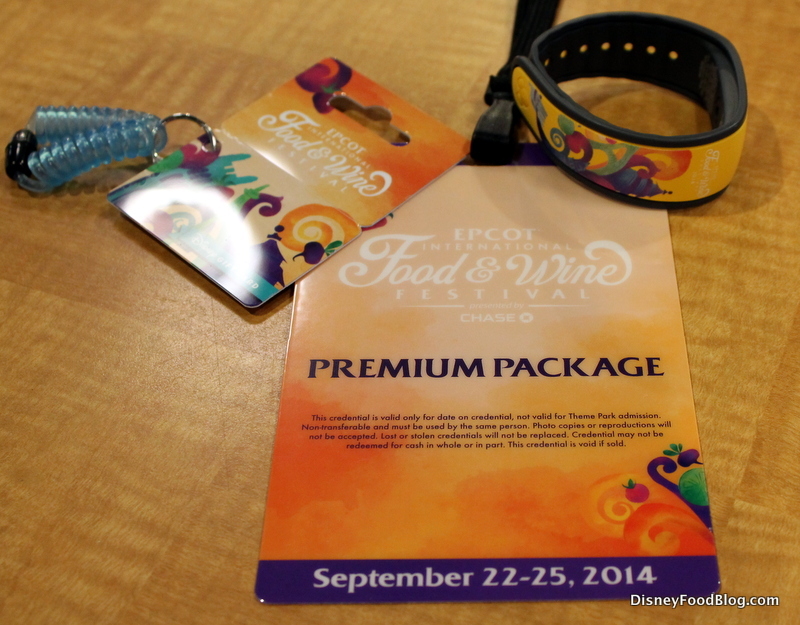 Today we’re breaking down the components into a few sections beginning with the Food & Wine Premium Package. At the end of the post, we’ll go over our thoughts regarding value for the price of these options. 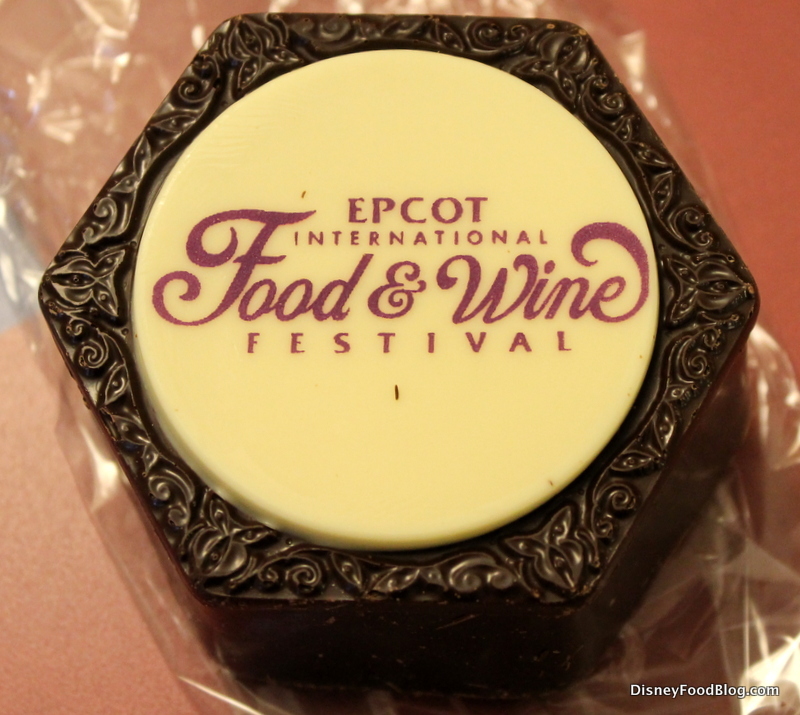 There are three main components to the Food & Wine Premium Festival Package available for Disney Resort guests: In-Room Amenities, dedicated Food & Wine Festival Premium Package Areas at Epcot, and entrance into the Epcot Food & Wine Late Nights Live! party. The package costs $199/person. I arrived to my resort a few hours early, hoping for the possibility of an early check-in. I was kindly accommodated, but since I arrived early, I actually picked up my gift bag at Concierge Services at the front desk. So, if you are participating in this package and are also an early check-in hopeful (before 3:00PM), that’s just something to keep in mind. With that said, I received everything in a thermal Food & Wine tote. 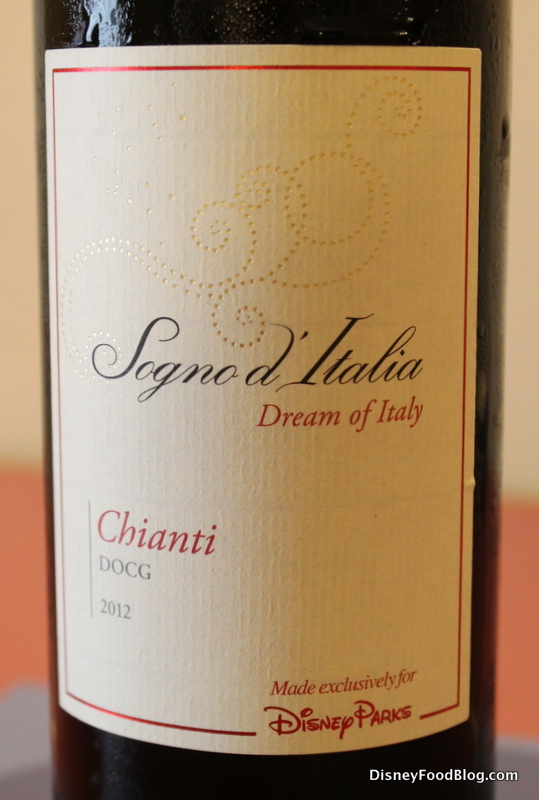 Guests can find this wine sold in the Italy Pavilion (we’ll have a “math breakdown” later on to discuss more of the value). A Food and Wine Festival souvenir stemless wine glass is part of the package as well. Four truffles came in an edible box made of dark chocolate, topped with a white chocolate themed decoration. 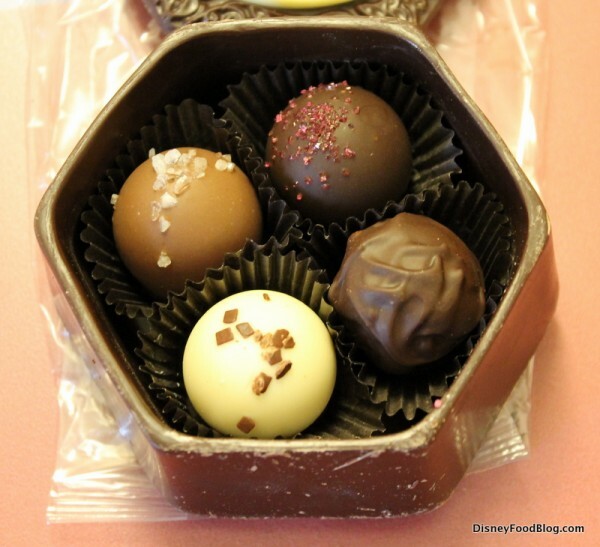 Flavors included salted caramel, cherry, ganache, and white chocolate. 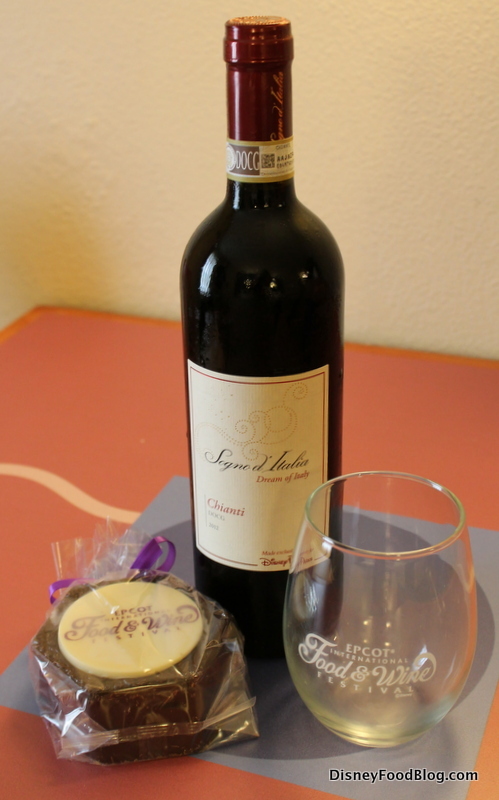 The in-room amenities are fun, and it did feel a little like a holiday, opening gifts upon arrival. But it may be the next three items that are of the most interest: a Food & Wine themed MagicBand, a $50 Disney gift card, and the Premium Package “credential” lanyard, which grants guests access to exclusive Premium Package Areas within the Festival. The credential is a lanyard to wear around the Festival, and while we’ll explore its design and function more in the next section, it’s worth noting that one side is printed with the dates the guest can access the Premium Package areas. 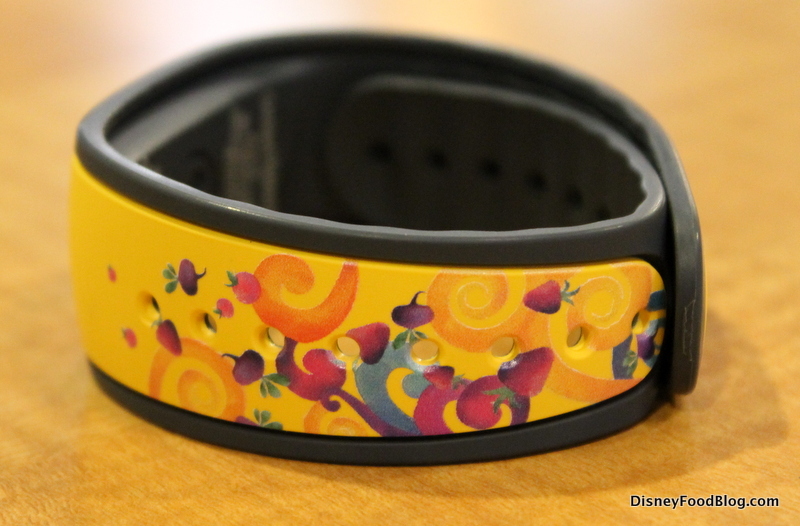 The MagicBand is decorated with the current signature artwork for the Food and Wine Festival. 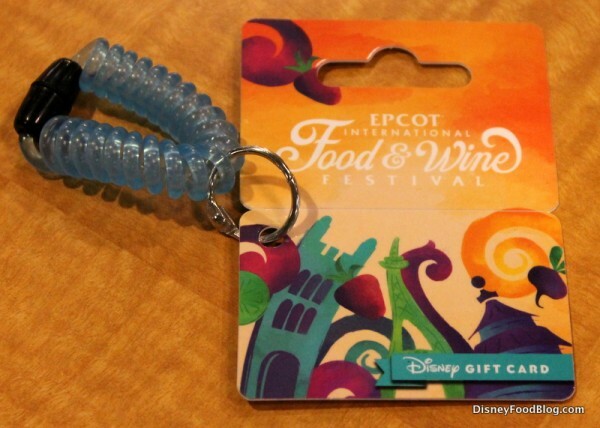 Finally, there is a $50 Disney gift card. It’s the “wristband” style for ease of use at the booths. 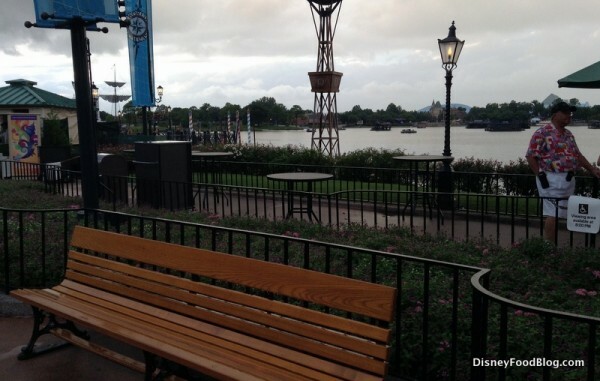 Ten locations have been placed around World Showcase for the exclusive use of Premium Package guests. These areas operate from 12:00 – 8:00 pm on Mondays through Thursdays. This is where that credential lanyard comes into play. Not only does it grant you access to those areas, but — cleverly — the designated areas are also printed on the lanyard. I didn’t realize how handy that little map would be until I arrived at World Showcase. Without it, I may have missed the areas. 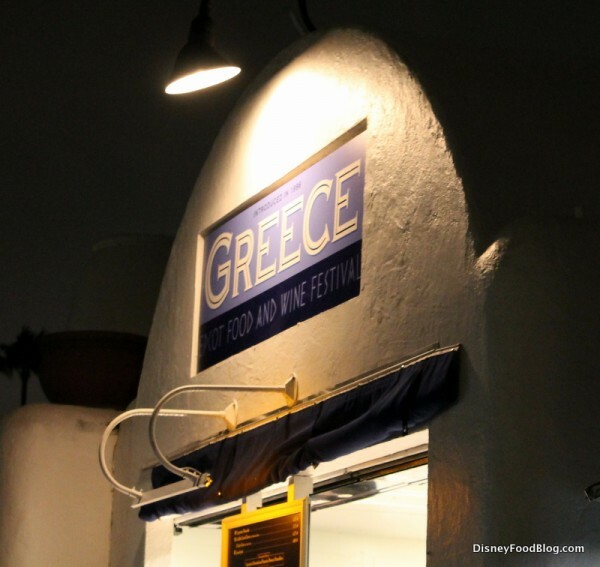 You will see that the designated spaces blend in quite well with the all-access areas, equipped with the standard Food & Wine Festival high-standing tables. What I really appreciated about this set-up was that it didn’t scream “PREMIUM PACKAGE HERE! !” Those who aren’t participants in the Premium Package will likely not feel excluded. I like how they blended in, while the credential map is detailed well enough to make the areas easy to find if you’re on the lookout. Step One: You arrive to the area as designated on the lanyard map, and see a sign that indicates which Marketplaces that particular Premium Area services. Step Two: You can show your credential to the Cast Members staffing the area (okay, actually the lanyard is huge, and they’ll probably spot it without you waving it :). 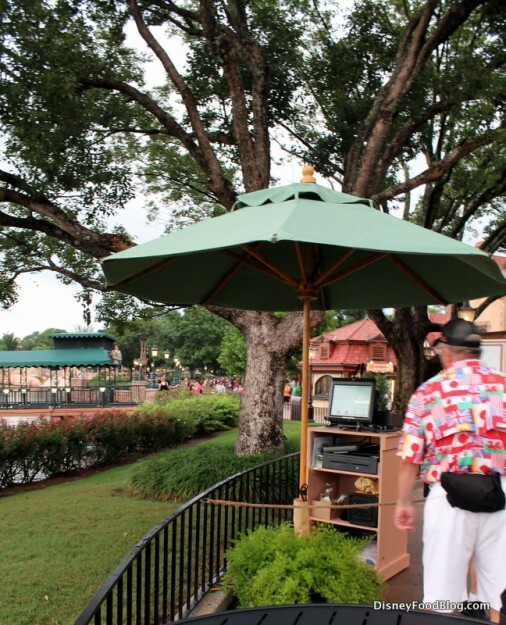 Step Four: Place your order, and pay for your item (cash registers are set up in front of the tables). Step Five: A Cast Member goes to the booth for you and returns with your item! 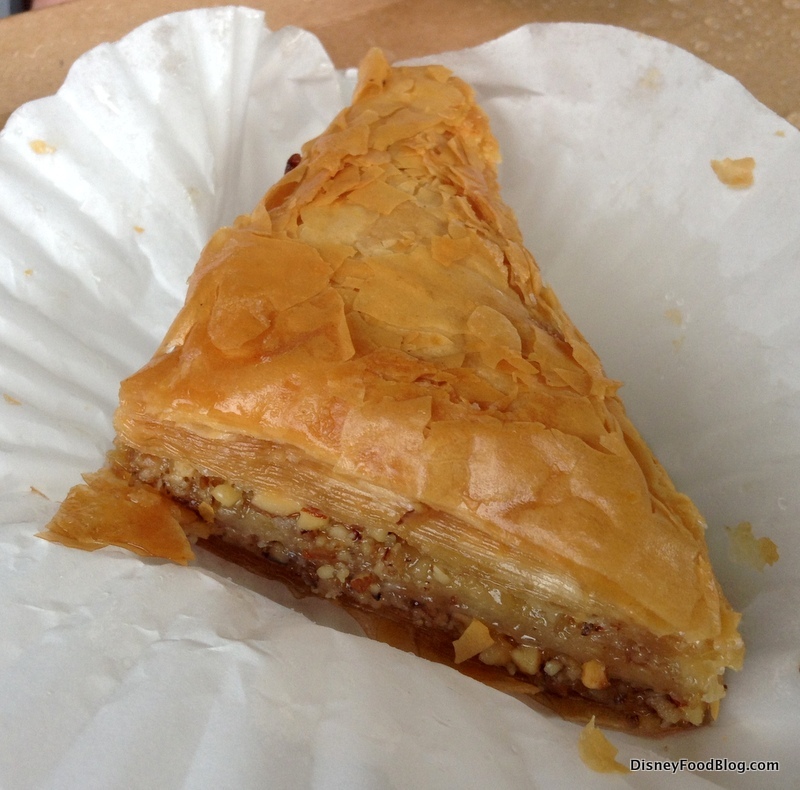 Here’s my tasty Baklava from Morocco, kept nicely dry by the kind Cast Member who brought it to me. Even Duffy had to defend against the elements! Now, while I really do think it’s cool how the Premium Areas blend in, this is a good time to mention that there is no covering or seating in the Premium Areas — at least, not at the time of this writing. It will be interesting to see if this changes as the Festival continues. 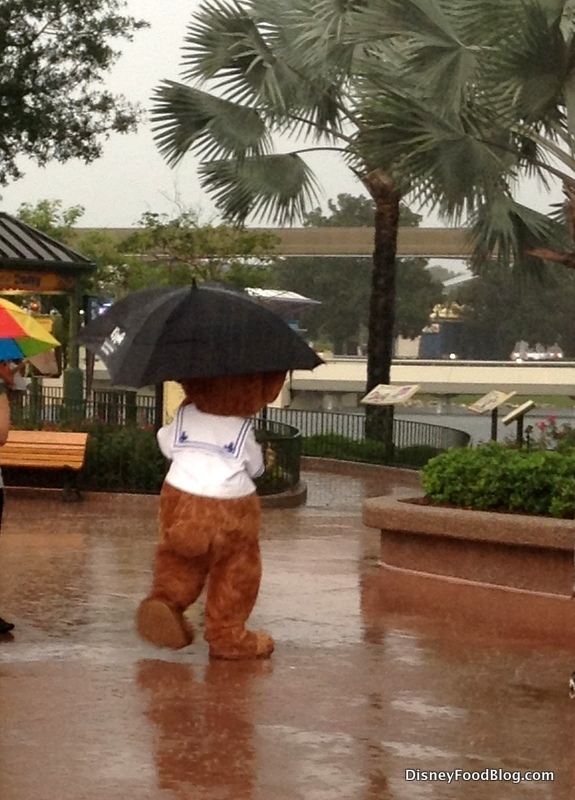 I owe many thanks to the Cast Members who did their best to keep me dry and helped me have a great time while noshing on my baklava. 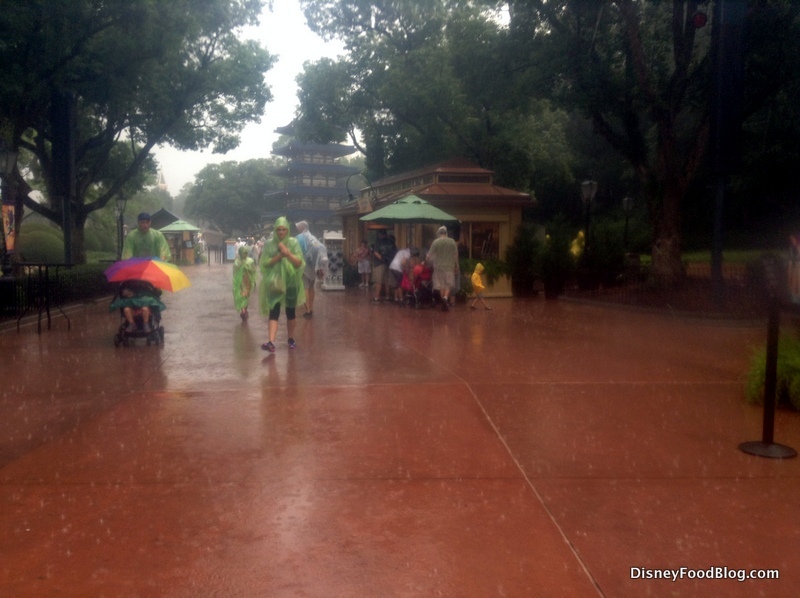 I had an entirely different experience when I returned two days later (though my resort stay was only one night, I had access to the Premium Areas through Thursday, as designated on my credential). The improved weather made it possible to really enjoy the premium views around the lagoon that have been reserved for this experience. 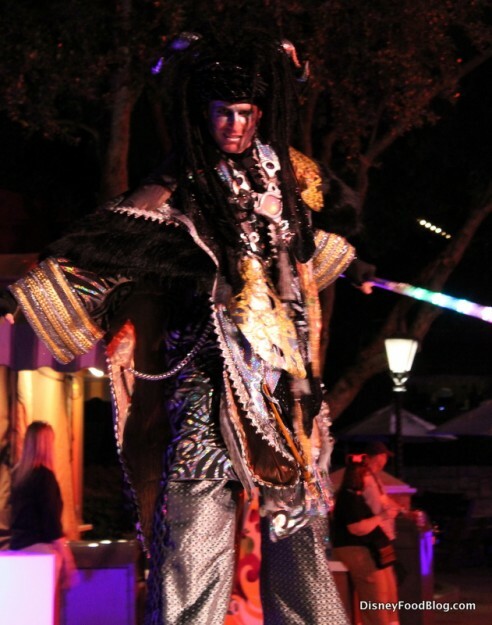 Cast Members do their best to provide a fantastic experience, waiting on guests in the area from arrival to departure, and ensuring you’re well taken care of. The whole not-waiting-in-line thing is definitely a great perk. Festival fans know how the lines can get, especially on evenings and weekends of the Festival. But it was also nice not having to hunt for a table. Top it off with some terrific views, great Cast Members and tasty food, and it really was an enjoyable experience. There is one more inclusion to with the Premium Packages, which is entry into the Food & Wine Festival – Late Nights LIVE! event. 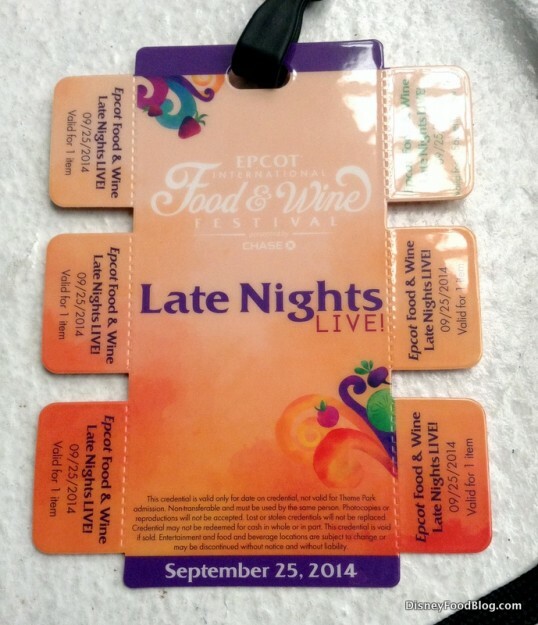 Part of the Premium Package is entrance into a Food and Wine Festival — Late Nights Live! after hours party. 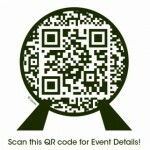 Entrance to this event can also be purchased as a standalone event for $79.00 (tax not included). The primary difference is that the Premium Package is available only for Disney Resort guests, whereas entrance to just the Late Nights Live party is available for non-Resort guests as well. Premium Package participants should note that this event only takes place on Thursday nights throughout the Festival, so you’ll want to be sure your reservation dates line up accordingly to receive the full value for your Package. 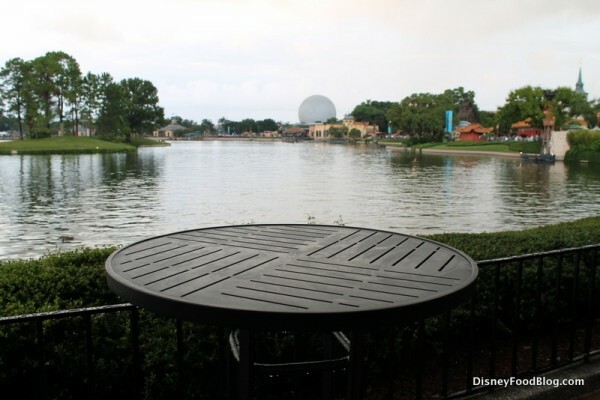 For guests who purchase this option as a standalone, admission to Epcot is included during the event as it is with other Disney hard ticket events. Where to start? 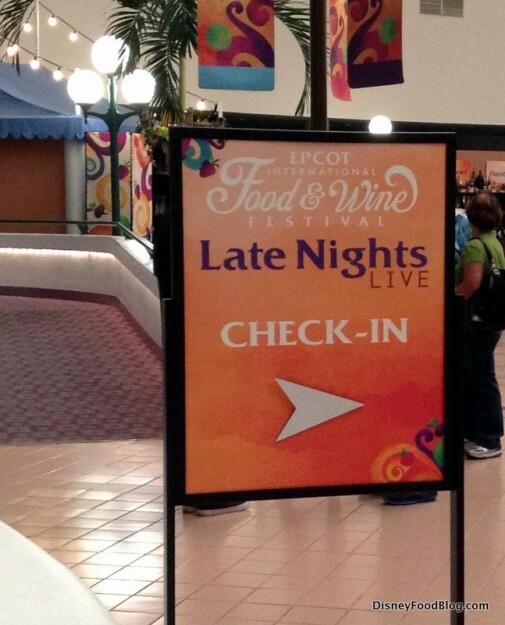 Party guests will want to head to the Festival Center in Future World where you’ll see a sign upon entering the building designating the “Late Nights Live Check-in” spot. 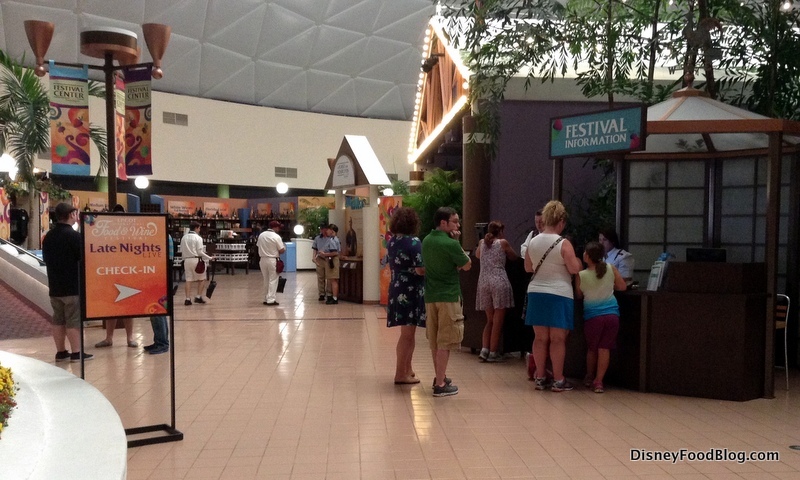 Because guests can access the event after hours, another check-in area is located at the International Gateway entrance into Epcot. 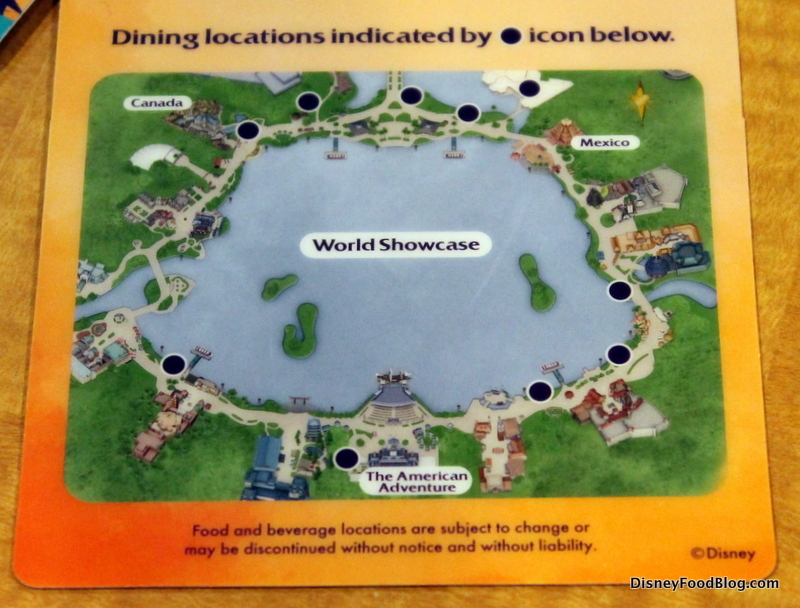 Five are marked as “Valid for 1 item” and one is marked “Valid for 1 souvenir glow cup” (more on these after we enter the party). 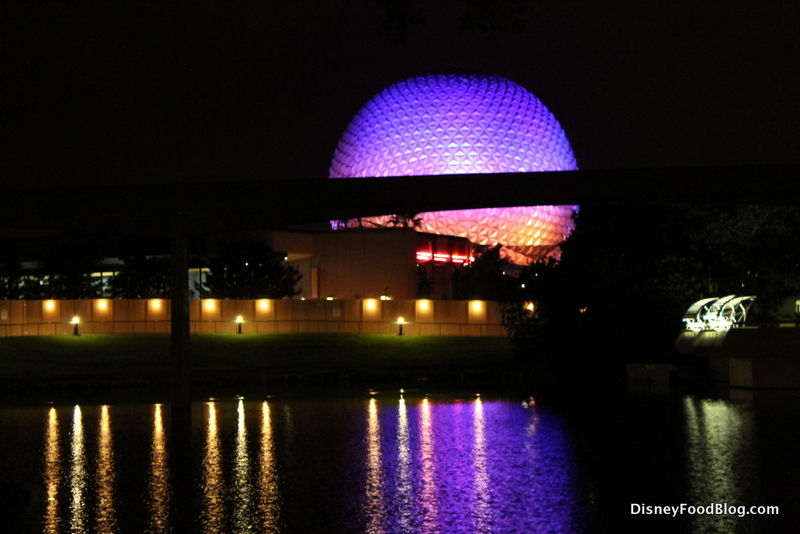 Typically, the finale of any great day at the Food & Wine Festival caps off with a viewing of IllumiNations. But the day isn’t over yet for guests at Late Nights Live! Once IllumiNations is over, you can make your way toward the United Kingdom Pavilion, where the designated party area extends into World Showcase Plaza and beyond to the center of the World Showcase Promenade. The party begins at 9:45PM and lasts until 1:00AM. 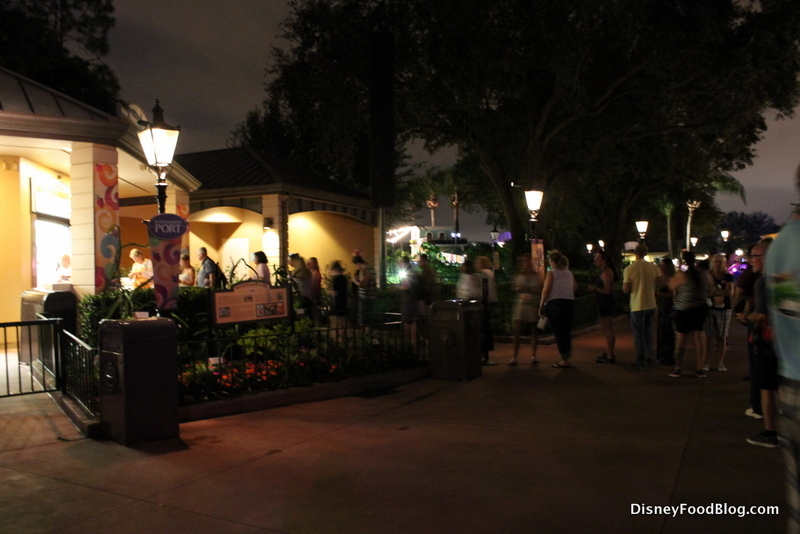 At first, it seems like just an extension of regular Epcot hours, enjoying the typical atmosphere of Epcot at night. 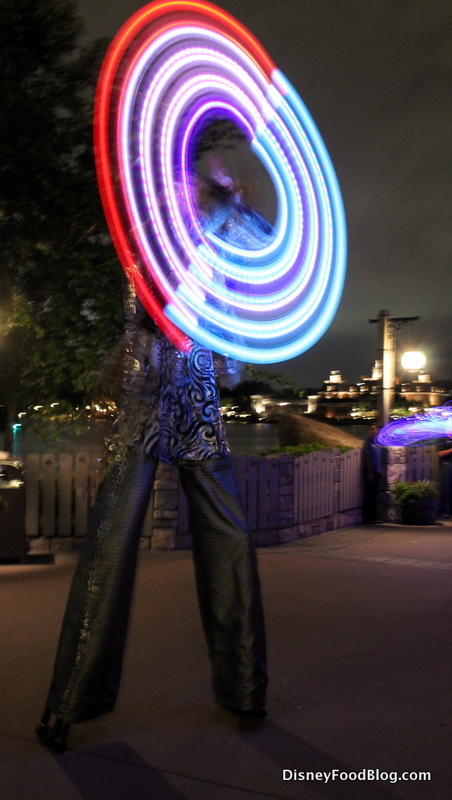 But things start to change with the arrival of street performers decked out in fiber optic lights glowing in the dark. So, umm… I’m sure there is a setting on my camera that works perfectly well for “dancers spinning fiber optics in the dark,” but since it’s not called exactly that, I have no idea what it is. Sorry for the blur! 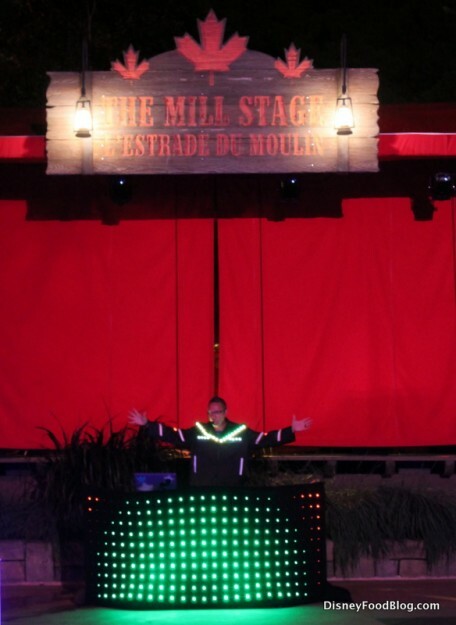 As you wander, you’ll happen upon other areas of entertainment, including a live DJ playing dance music to deliver a party vibe. Other areas housed live musicians, and I thought they were top notch talent. 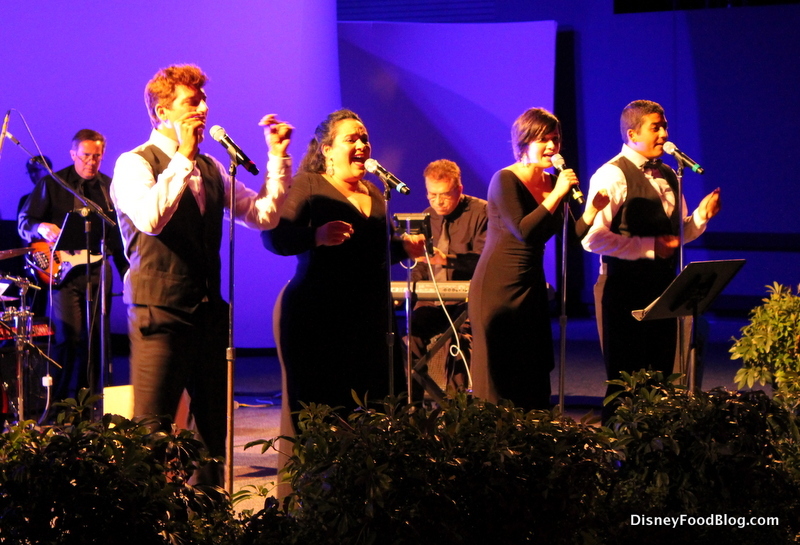 I spent a good chunk of time in World Showplace, listening to “Martini Pop,” a band playing everything from classic jazz to current hits (and even a few Disney classics) with unique arrangements and impressive vocal power. And outside near the Canada booth, a duo performed acoustic versions of songs ranging from the Black Crowes to Macklemore to Johnny Cash. 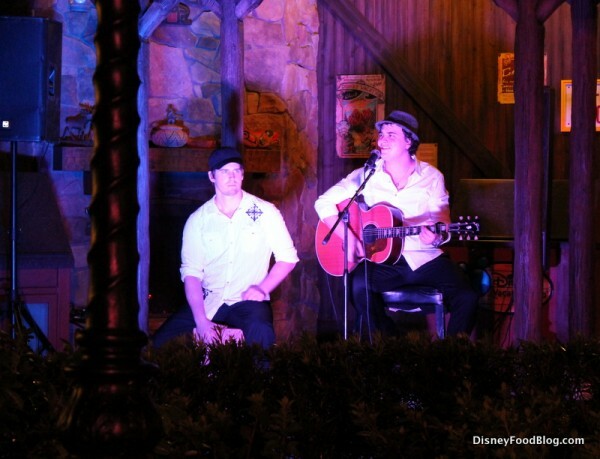 If you’ve ever happened upon Bryan Malpass (the guitar player and vocalist) playing live in Downtown Disney, you know what a treat it is to listen. 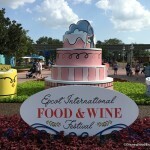 Of course, what’s a party — especially one at the Food & Wine Festival 😉 — without eats? 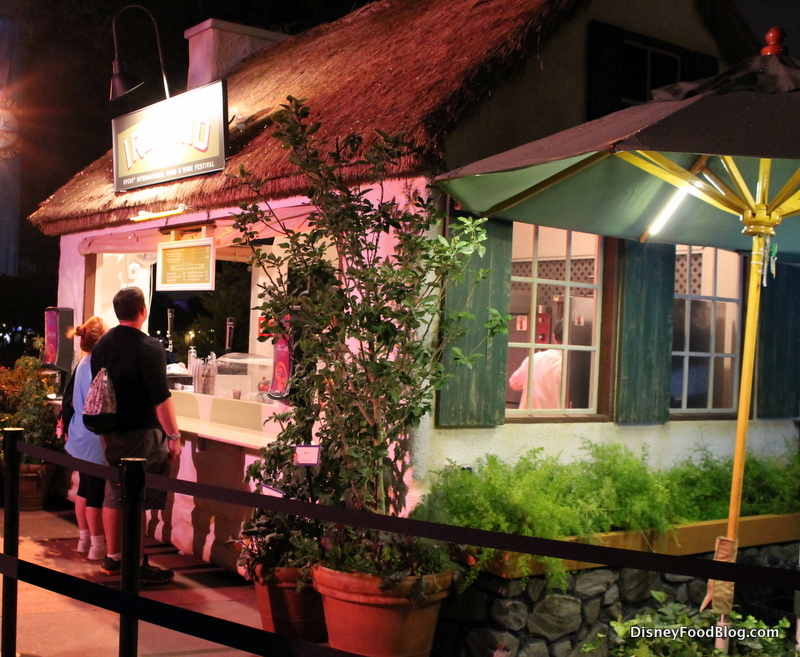 Be sure to have your lanyard handy, because you’ll be able to use it for five food or drink items of your choosing at the following booths: Ireland, Canada, Greece, the Refreshment Port, Desserts and Champagne, and Hawaii. 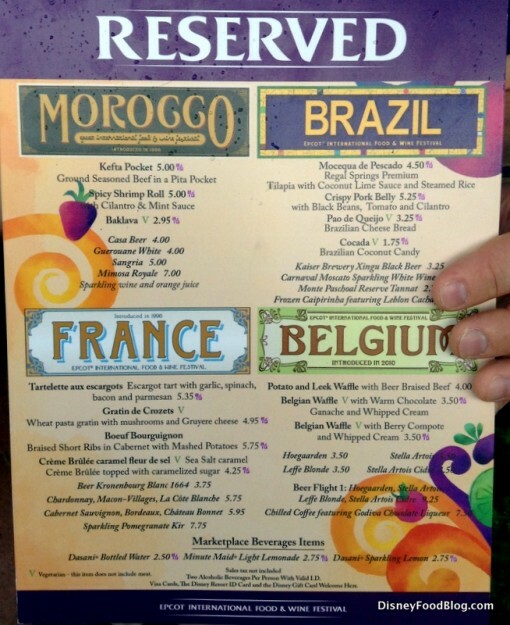 The full menus are available, and nothing is off limits with your entitlement coupon. My one moment of concern was when I tried to make use of my coupon valid for the souvenir glow cup. It can be redeemed at the Refreshment Port, and I headed there right when the party opened. 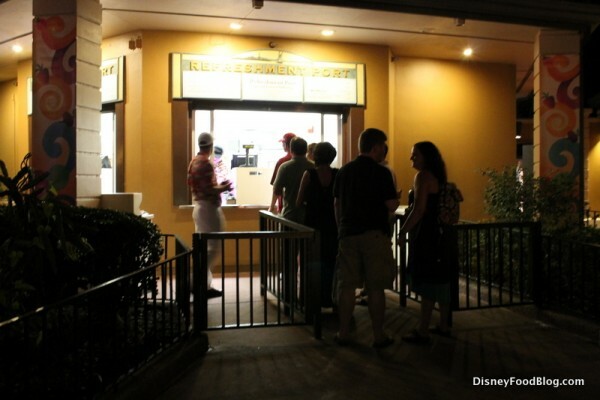 The line looked like this, and I feared for overcrowding for the rest of the night. It seemed lines in the immediate opening were really long everywhere. However, that was the opening rush. I left the line and explored some of the entertainment options for around 20 minutes, and when I returned, I practically walked right up. I didn’t have a problem with major lines for the rest of the night. 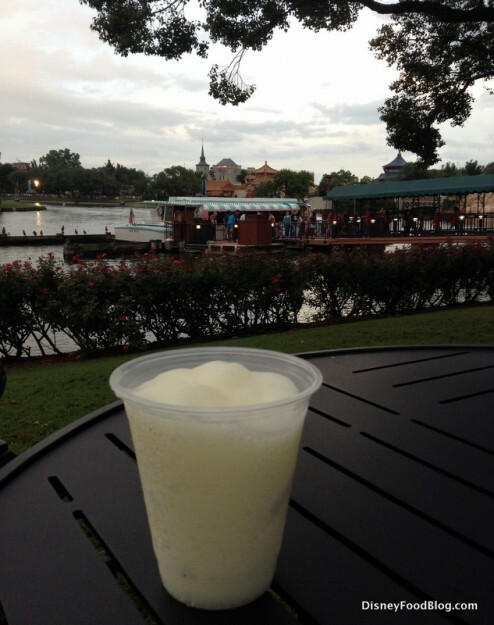 The souvenir glow cup was filled with a surprise: a White Cranberry Cosmo, which I thought was delicious (I like fruity, sweet drinks). The cup is plain (no Food and Wine logo or anything), but walking around and seeing the glowing cups was a fun, bright touch. 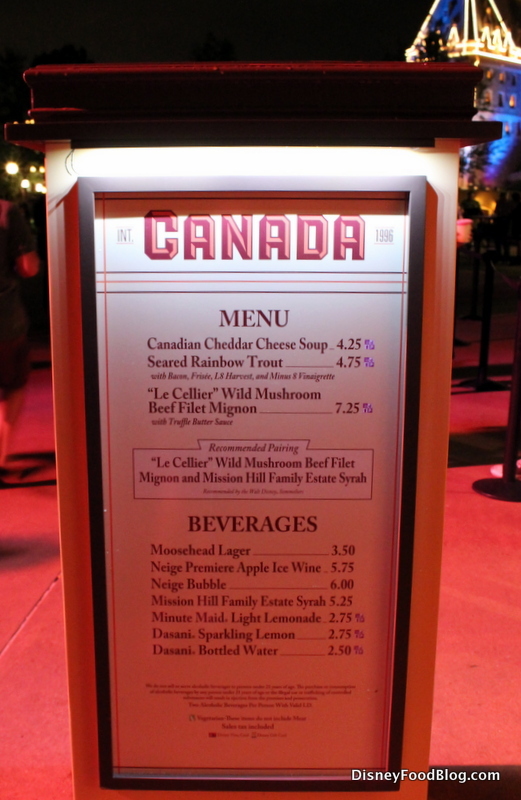 We’ll be adding up value more at the end of this post, but for those interested, there were a few small bars inside World Showplace selling the signature beverage in case you wanted another, and the prices were $8.75 for just the Cosmo, $4.25 for the glow cup, and $13.00 for the drink served in the glow cup. 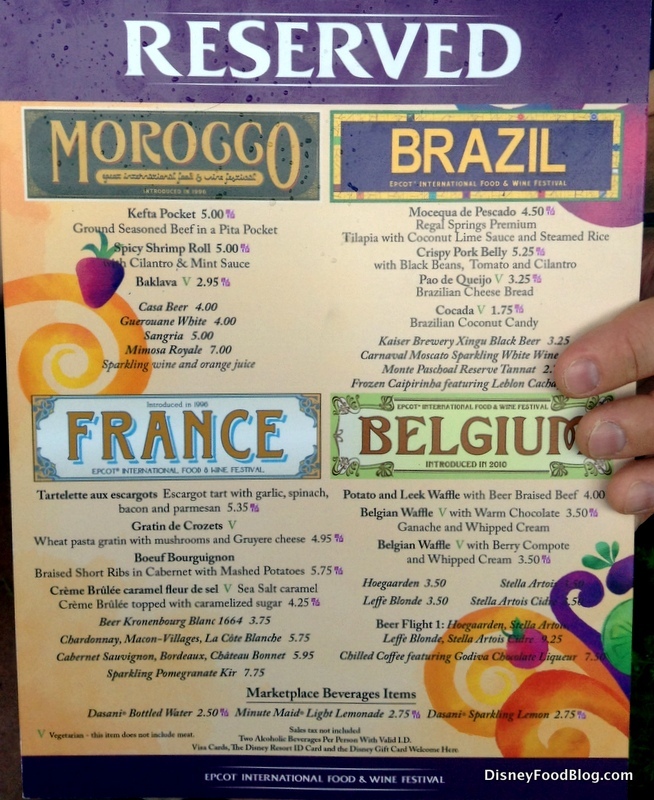 As for my food choices, I enjoyed some of my favorites: Cheddar Cheese Soup and the Beef Filet from Canada, Warm Chocolate Pudding and a Chilled Irish Coffee from Ireland, and a Kalua Pork Slider from Hawaii. 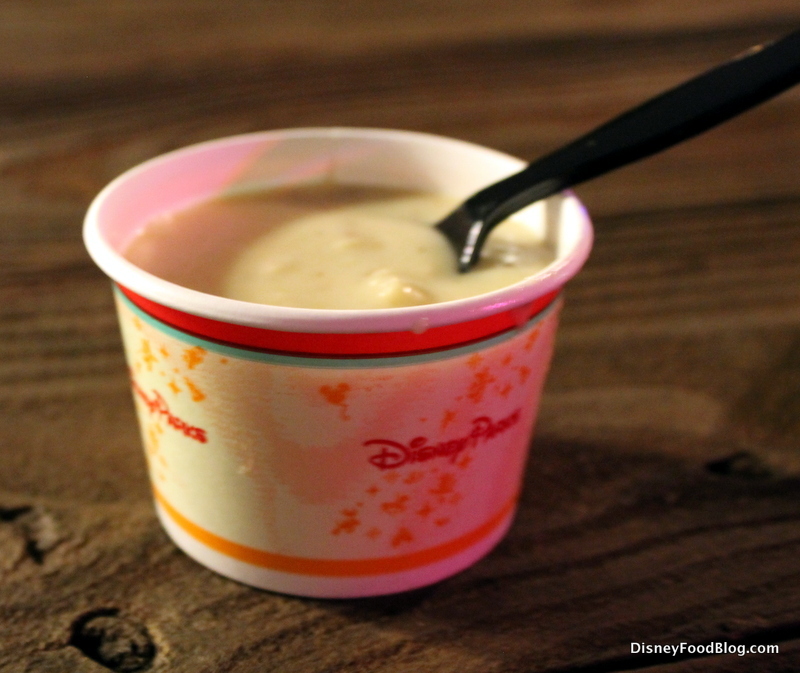 Cheddar Cheese Soup… at night ;)! Out of pocket, these items would have cost $25.75. Clearly, this is the place to maximize your value. 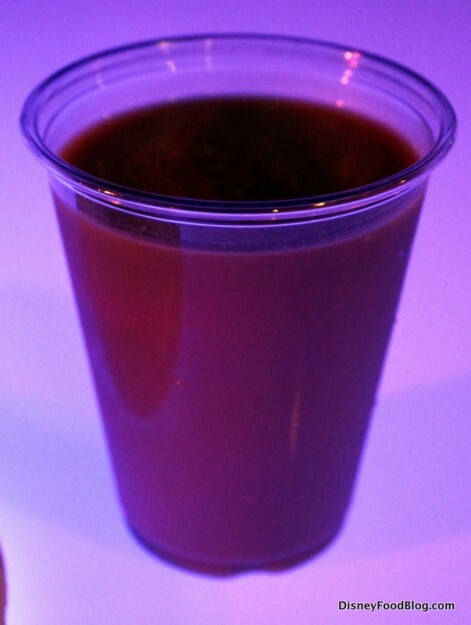 As it so happens, some of my favorite items are on the less-expensive side (the Pudding, Slider, and Cheddar Cheese Soup range from $3.50 to $4.25), while my most expensive items were the Irish Coffee ($7.00) and Beef Filet ($7.25). How you choose to maximize your entitlements is up to you. For those who enjoy the beautiful and unique atmosphere that is Epcot at night, it’s always a treat to spend more time there. I do feel like this event is finding its legs in some respects: there wasn’t really an official start, per se, so the beginning felt a little disjointed to me. There was a “where-do-I-go-now” vibe for the first bit, which likely contributed to the huge lines at first. 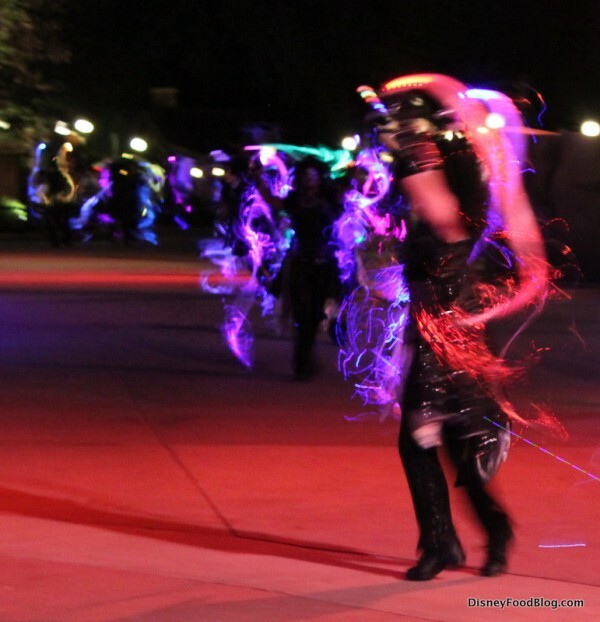 Dancing in the street was encouraged, but there wasn’t much participation — however, that’s not a “fault” of the event, just part of the general vibe that I wanted to share for those looking for a certain atmosphere (though a few people did dance and appeared to be having a great time! As Men Without Hats always said, “You can dance if you want to!”). Still, the opening is an easy fix, if they so choose, and the crowded lines seemed to fix themselves fairly early on. I think fans of live music will be pleased — while the options aren’t numerous, they’re high quality. Since we’re clearly very food-focused here at DFB, I hadn’t accounted for the difference that would make in my experience, but it really did. The price for entrance to the Late Nights Live! party is $79.00 (tax not included). 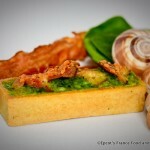 Included are 6 food items, and the value will vary based on what you choose. 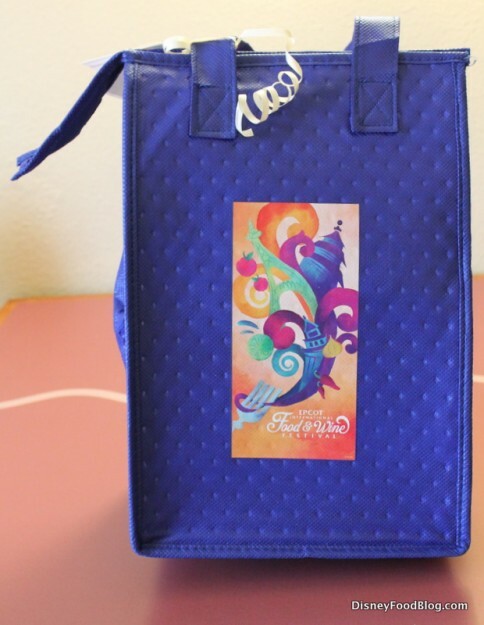 The items I chose would have cost $25.75, and the cost of the Cosmo in the souvenir cup brings the total to $38.75, leaving a remaining $40.25 for entertainment and the chance to stay at Epcot until 1AM. If you use each of your entitlements for items ranging around $7, there’s potential to bring your food/drink value to $48 (including the Cosmo). The price of the Premium Package is $199.00 (per guest, tax not included) and includes in-room amenities starting with the Chianti, which retails for $16.95 in the Italy Pavilion, and a Festival wine glass, which I’m estimating at $10.00 based on a comparable item sold at Festival merchandise shops. (I don’t have a value for the truffles.) 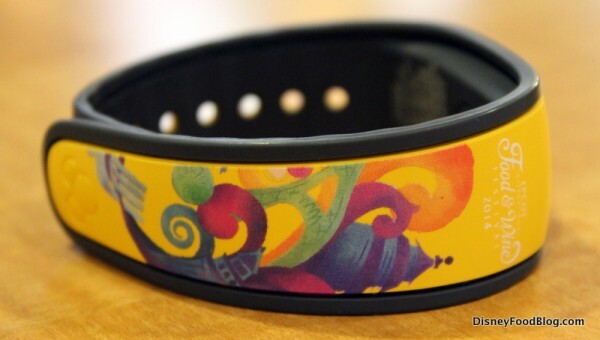 Themed graphic MagicBands are relatively new and prices vary, but the recent Haunted Mansion graphic MagicBand retails at $24.95, so that’s a price example (the Food & Wine specialty band isn’t available for individual purchase). The $50 gift card is worth… well, you know 😉 . Also included is the $79.00 entry cost to the Late Nights Live party (breakdown above). That brings the estimate to $180.90, leaving a remaining $18.10 for access to the Premium Areas. Whew! Still with me 😉 ? Clearly, either of these options is a definite vacation splurge: they aren’t cheap, and it’s up to each interested guest to determine if they find value in the inclusions. In the Premium Package areas, I was joined in the space a few times by couples celebrating their anniversary and honeymoon; I thought it could be a really special touch to add on the occasion, and hope that was the case for them (though I want to stress again, the price of the package is per guest, not per vacation reservation, so that’s something to consider). From my perspective as a solo guest, I can say it enhanced my experience. I attended the first Late Nights Live party, and I enjoyed it. I spoke with a few Cast Members (I’m guessing managers), who were at the event and spoke about how they were observing things to see what could be improved upon to make it bigger and better, and we’ll be curious to hear about any experiences as the Festival continues. Here’s hoping everyone is having a great time at the Festival so far this year! Six weeks left… hope to see you there! 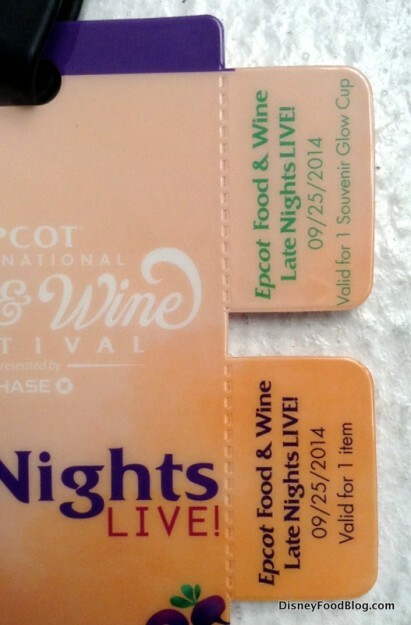 Have you participated in the Food and Wine Festival Premium Package or Late Nights Live! Party? We’d love to hear about your experience with a comment! Also included in the Premium Package (within the credentials they give you) you get 4 food or beverage entitlements will be able to choose plus one Sparkling Illumination Dessert party… yay!!! I have called the Reservation Department 3 times today, and little by little I am putting together this puzzle… sorry if this seems confusing (because it is to me) but I really want to understand what I bought. 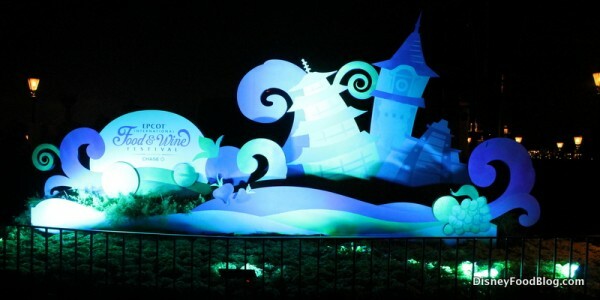 So far, and if it really includes the Sparkling Illumination Dessert Party, it will be a good buy, even without the food entitlements (only 4 per package). 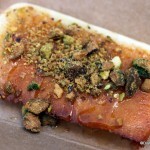 NOT having to look for a place to sit and eat, and even better not to stand in line for the food… totally worth it! And the Dessert Party is a MUST GO all on its own! Lili — Thank you so much! We’re calling now, too, to see what we can find out! Much appreciated! 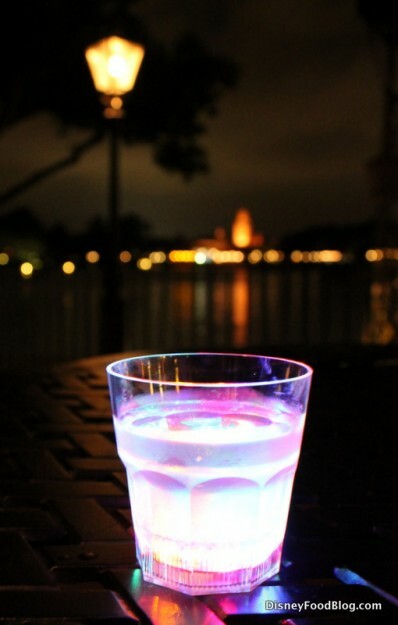 I already bought the package, and I am going to go with YES: they do have the Illumination Dessert Party included with the package. 2 out of 3 Cast Members said they have it, and in both cases they said they had to look under a different Page (not sure what that means) but that yes, it is included. One of the reasons why I would go ahead and buy it now is because this year, you don’t have to stay on property to buy the Premium Package. Last year that was a requirement, and they were sold out for a lot of the days (Specially by the end of the event). I just don’t want to take the risk of not having it. In my experience, men (my husband among them) HATE standing in line constantly and not finding a place to sit and relax while enjoying food samples… This Premium Package made it enjoyable for both of us, and for a lot of the husbands we met at the reserved sitting. Not to mention that many of the couples we met, gave us recommendations for food and drinks everywhere. 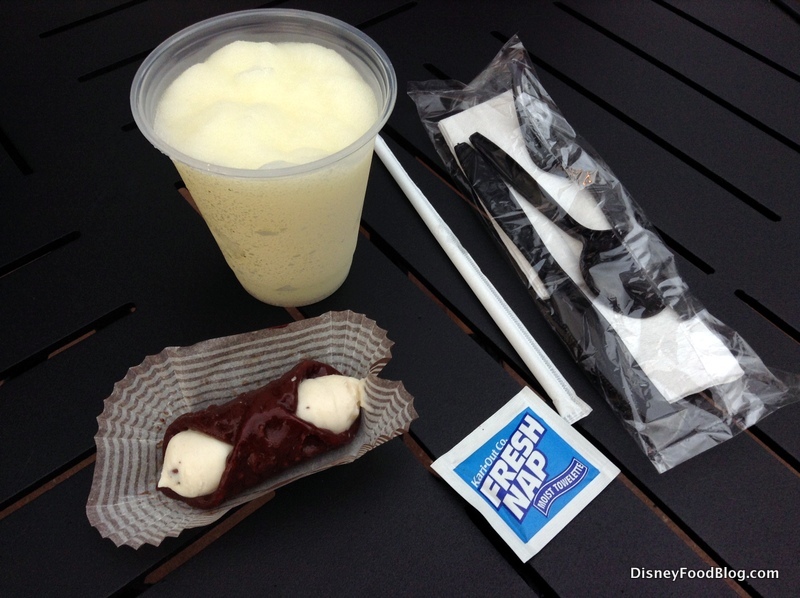 I got the package and they had me pick a day for the dessert party. Was told to call back to set up the date for the culinary I tried again today but still can’t set it up. Hope I don’t lose the place we want. When I called they said you COULD use vouchers on multiple days. We purchased the premium package the week it opened up. I figured if it was close to the same as last year it would be fine! Just like last year there was a lot of confusion about it from the reservation folks. I called last week again and was finally able to book my demo! We are going to be there Oct 26 and got the Whisky demo! Which is the one we wanted. I have been told 2 different things about the Desert Party. One person told me we had to go to the one on Wednesday night, the other reservation agent told me it was any night they have it. So I figure once the event starts, we will get feedback from people that have the package. We will be at the food and wine festival in October, 2016. There will be 2 of us, possible 3. I am curious about the food and wine premium package. I’m guessing that is one of us purchases it, we all have to purchase it in order to eat together. Am I right? 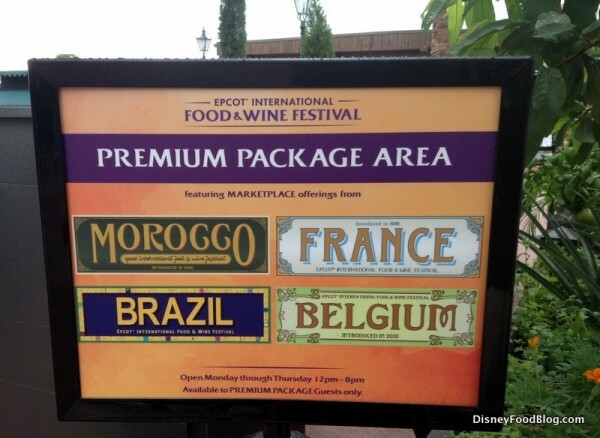 Also, if we each purchase the food and wine premium package, will each of us get a bottle of wine, a wine glass, the bag, and whatever else comes with the package? We will all be in the same room at the Beach Club. Each person that buys the premium package gets the “perks”. 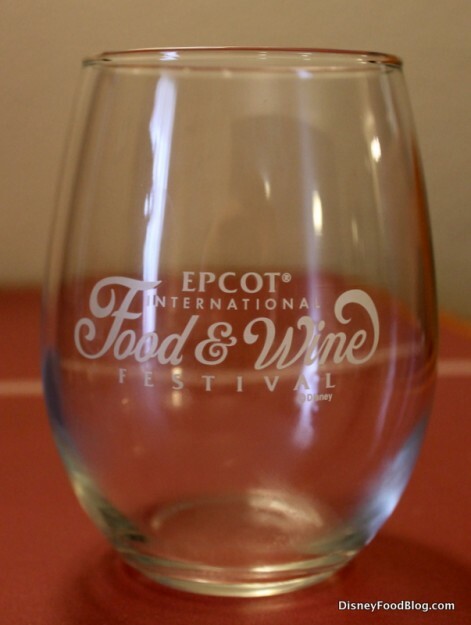 So if it is like the past 2 years, each person gets a bottle of wine, wine glass last year they gave us special magicbands, enterance to a desert party and a seminar. Plus entitilment coupons for free items at the kiosks. I think we each got six. Plus you get the lanyard to gain access to the ” premium areas” . This premium package is only good on Monday – Thursday. Not weekends. We have used it the last 2 years and enjoyed it. If they offer it this year, then you are correct that everyone who wants the benefit must pay for it. And each person that does purchase it will get all that is included, the wine and glass, etc.